I met Malakai Tupou many years ago on one of my many visits to the Marae. Malakai is the grandson of Bruce Stewart and is of Tongan and Maori heritage. A builder by trade, Malakai is now living at the Marae in a whare bearing his name. 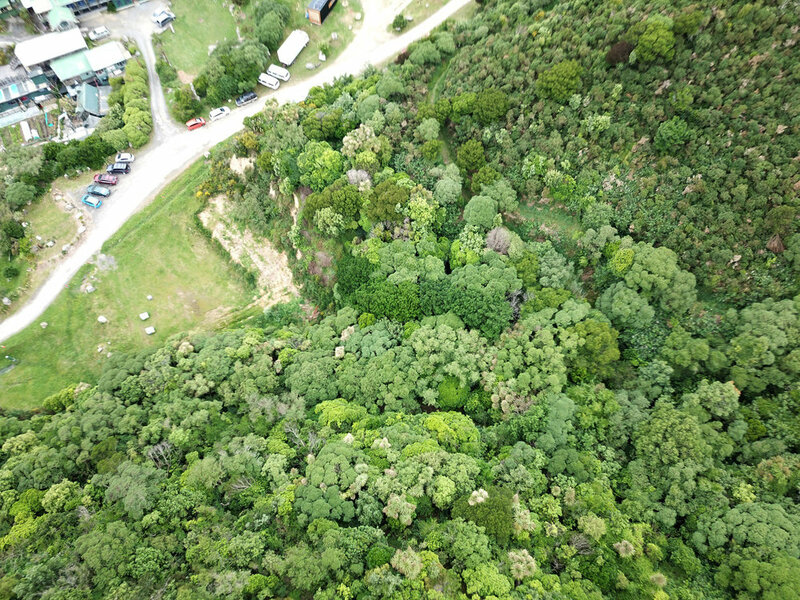 Last month I asked Malakai if he could get some images of the Manawa Karioi Reserve with his drone so we can document the progress of the restoration project and see the reserve from above as the birds do. Tell me about your history with Tapu te Ranga Marae? I’m a grandson of the founder of Tapu te Ranga, Bruce Stewart, so have been coming here since a wee kid, de-nailing timber and straightening out nails was something I remember doing as a kid. Do you use the Manawa Karioi reserve yourself (how)? I use it nearly every day to walk my dog, there are lovely bush walks and views. What is your impression of how the Manawa Karioi land has changed over your years of living here? When I was a kid, I remember walking up with the cousins to the pine trees and surfing down with cardboard trying to dodge the gorse, nowadays you can't as the native trees have pushed through and have created the lovely native bush we have today. Tell me about your experience taking the drone photos, what were the challenges? The day was a little windy so didn't want to fly too high, also there are planes that fly above so I just had to keep an eye out for them. Do you see people using the tracks, what do you think this reserve gives back to the local community? I see a lot of people using the tracks, dog walkers to tourist walkers to runners, the locals I talk to love the tracks and enjoy walking. My grandfather once told me in one of many of his ideas he shared with me that, if everyone planted a native tree in their backyards it would benefit our future generations, and how true is that. To have one of the best reserves in Wellington in your backyard is awesome. Introduction and Questions by Ness Patea.